Nigeria’s President Goodluck Jonathan has vowed to defeat militant group Boko Haram, after a series of attacks blamed on the group in recent weeks. Earlier on Thursday, at least 10 people were injured by a suicide bomber near a church in Gombe, north-east Nigeria. On Wednesday, 11 people were killed when a bomb went off on a bus heading from Gombe to neighbouring Yobe state. Mr Jonathan said the group had caused “agony” in the country. They killed at least 2,000 civilians in 2014. 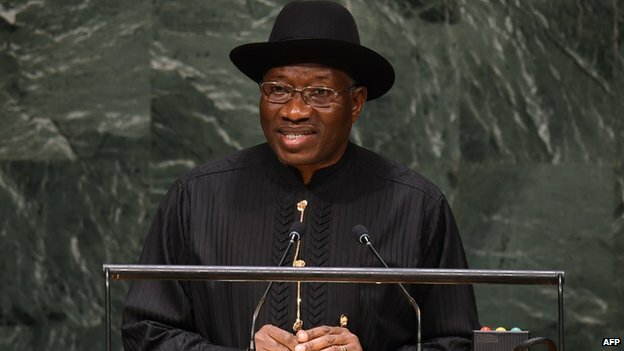 “I want to assure you that the terrorists will not get away with the atrocities, they will not win,” Mr Jonathan said in his new year’s address. Mr Jonathan, who is up for re-election in February, has made similar pledges before and has faced criticism for failing to stop the militants. North-east Nigeria has seen a spate of attacks blamed on Boko Haram. 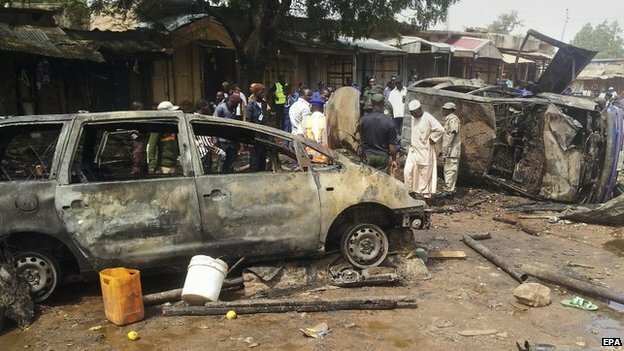 At least 26 people were killed in bomb attacks in the cities of Gombe and Bauchi in December. On 24 December, Nigeria’s Borno and Yobe states imposed temporary travel bans in an attempt to prevent attacks by Boko Haram. The group, whose name means “Western education is forbidden”, has been waging an insurgency to create an Islamic state in the region. Last year, a state of emergency was imposed in the north-eastern states of Borno, Yobe and Adamawa in an attempt to beat back the militants. However, the group has stepped up attacks since then, seizing large swathes of territory in Borno and capturing hundreds of people, including women and children, during raids on towns and villages. Posted on 1st January 2015 by newsafrica. This entry was posted in #BringBackOurGirls, Africa, Boko Haram, Nigeria, President Jonathan. Bookmark the permalink.